With Intermapper probes, there’s no limit to the types of network devices, connections, and conditions you can monitor. Browse a wide variety of free, customer-contributed network probes below. Use the filters to search by element, vendor, or category. When you've found one you want, download the probe, then import it into your Intermapper probes folder. All probes contained in this library are customer-contributed and are the customer’s responsibility. We do not guarantee the functionality of these probes or maintain them. Please contact support.intermapper@helpsystems.com with any questions. This command-line probe uses a Visual Basic script to test a Windows Fileshare. In addition, it provides a nice example of calling a Visual Basic script from a command line probe. Detect the state of a specified service on a Windows machine from a Debian Linux machine utilizing the wmi-client package. (Note: The probe requires that you install the wmi-client package and place the included wmi-service.sh script in the InterMapper Settings/Tools directory on the Debian machine running InterMapper. This command-line probe monitors an Oracle database. It uses the TNSPing utility that is part of the Oracle distribution to query an Oracle instance for the availability of a particular database. It also offers a good example of how to create a Command-line probe. 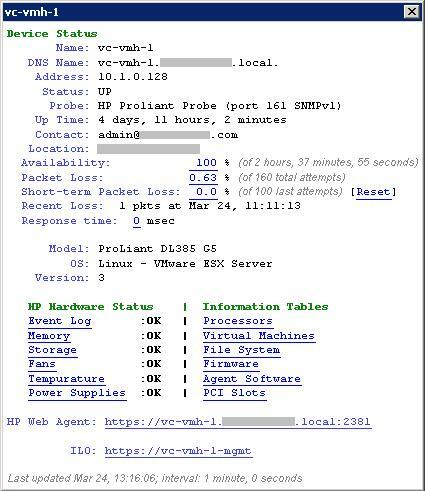 Denn Omar O. Jara of Alpha Horizons in Riyadh, Saudi Arabia sends a probe to monitor an individual VM guest inside a VMWare ESXi host. The probe displays the VM Guest name, OS, Memory size, and state. 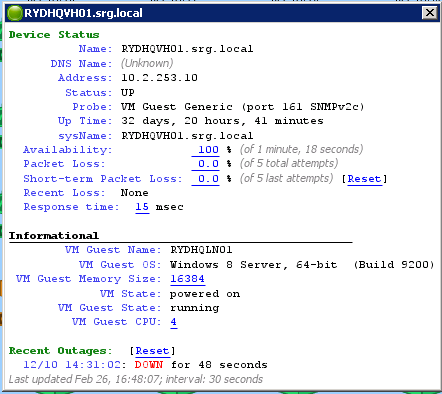 It sends alerts if the VM Guest is not running or powered off. Monitors temperature and humidity for the APC AP9230 Environmental Monitoring System and alarms when thresholds are exceeded. Monitors the temperature and relative humidity of an APC Environmental Monitor. This probe can monitor the values of up to two APC probes. Monitors the conditions (temperature and relative humidity) from an APC environmental monitoring card. Monitors an MGE "UM-Sensor" environmental sensor with a UM-Link Ethernet interface via SNMP. The probe can be used as a starting point for the design of similar probes, but this implementation assumes a single UM-Sensor (up to 4 could be daisy-chained) on the assigned comm port of the UM-Link interface (i.e. it only looks at the first entry in table that indexes sensor units). Ilias Manos from Piraeus Port Authority in Piraeus, Greece sends a probe that monitors the temperature, humidity, water and open door of a APC Netbotz 200. 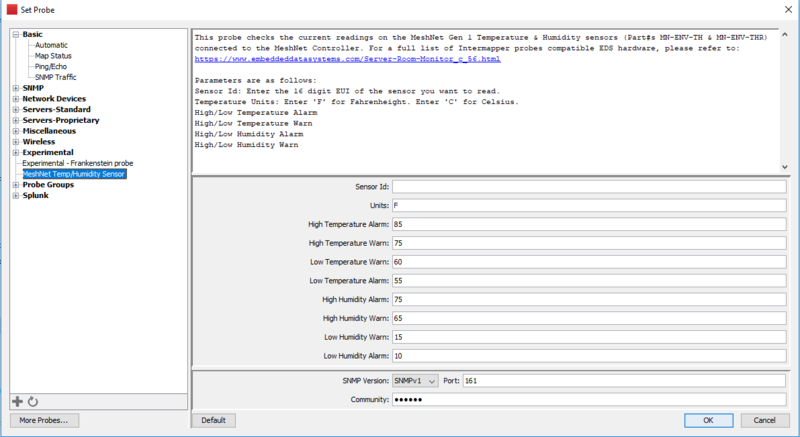 Ilias writes, "We needed a software to monitor the temperature, humidity, water and open door of racks with Netbotz. Intermapper Probe Cost = Free." Monitors the temperature, humidity, and airflow of a Netbotz 320 device. It will also alert when the camera motion sensor goes off. Provides internal and external temperature monitoring and alarm capability. An edited copy of the original EDS Environmental Monitor probe, modified to work with the DS18B20. Monitors a few or a hundred HA7Net temperature sensors: see the HA7Net page for more details. Monitors Temperature, Humidity, & the Dry Contact in the MeshNet Gen 1 Temp/Humidity Sensors. Monitors the very clever Weather Goose environmental monitoring device. The WxGoos-1 has built-in sensors for temperature, humidity, airflow, sound, light, and three I/O terminals and has a web, SNMP, XML, PDA, and WAP interfaces. This probe is for the WxGoos-1 internal sensors only. This probe graphs all the sensors and has low- and high-alarm and warning for temp. The WeatherGoose is made by I.T. Watchdogs, Inc.
Michael Graziano from Premier Heart LLC in Port Washington, NY sends a probe that monitors an EnviroMux Mini. The probe displays temperature, humidity, water and the state of alarm contacts. The EnviroMux Mini can be used for environmental monitoring in manufacturing or office spaces. Monitors the temperature measured by the SNMP-Link SL60 & SL61 sensor units, manufactured by Omnitronix of Seattle, WA. These boxes also have RS-232 ports, switch closure inputs and relay outputs, all of which can be read by SNMP. Monitors temperature, humidity, air flow and contact closures reported by the Ravica BitSight environmental monitor. 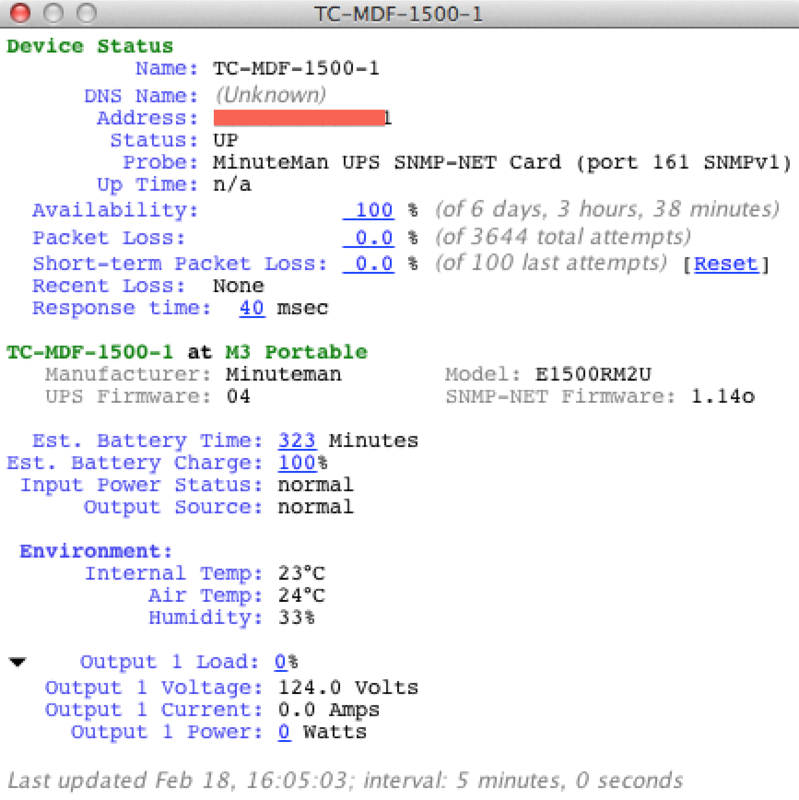 Uses a TrippLite SNMPWEBCARD UPS/PDU add-on card as a temperature and humidity monitor. 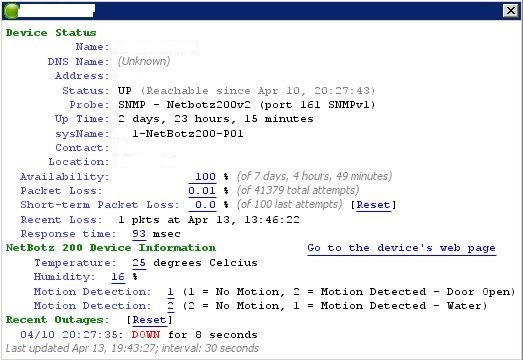 Allows the user to graph these values to track conditions at the device location using SNMP. Monitors the Data Aire gForce Data Center AC Units. Matt Smith of County of Santa Barbara submitted this probe in the 2017 probes contest. This command-line probe uses SNMPTT (SNMP Trap Translator) to translate SNMP traps into human-readable messages. It requires a shell script on the host that tails snmptt.log and extracts the error level and message, delimited by a pipe. This probe then remotely executes that shell script via a local shell script. Facilitates the monitoring of LBT-RM receivers. A table of all LBT-RM receivers can be viewed, as well as aggregate statistics for all LBT-RM receivers on the monitored node. Facilitates the monitoring of LBT-RU sources. A table of all LBT-RU sources can be viewed, as well as aggregate statistics for all LBT-RU sources on the monitored node. Facilitates the monitoring of TCP receivers. 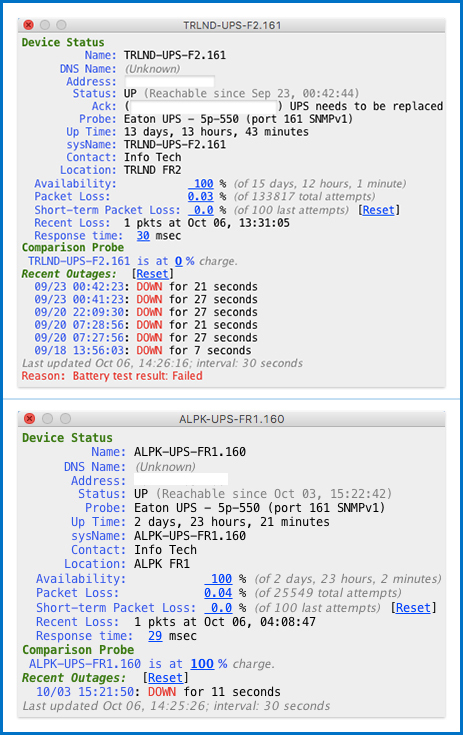 A table of all TCP receivers can be viewed, as well as aggregate statistics for all TCP receivers on the monitored node. 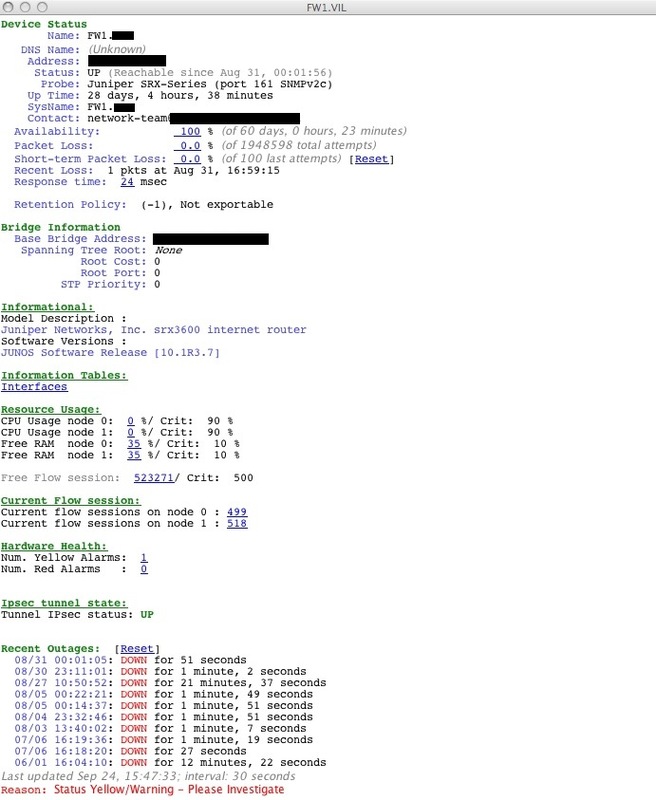 Facilitates the monitoring of TCP sources. A table of all TCP sources can be viewed, as well as aggregate statistics for all TCP sources on the monitored node. James Pugh from eBay Enterprise sends a probe that checks the number of active connections through a firewall and alerts if the number of connections changes by a predetermined percent over the polling period. It also has thresholds at which point it will not alert even though a rate of change threshold has been crossed to reduce false alerts during times of low traffic. "We needed a way to be alerted to potential service impacting connection spikes from either legitimate or malicious origin. Or conversely significant drops in connections which may signal some other issue within the data center or applications." 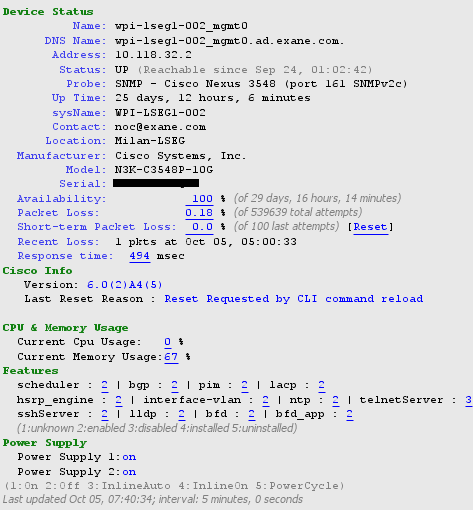 Benjamin Hubert at Exane created this probe to monitor CPU, Memory utilization, and environment of a Cisco Ironport C680 email security appliance. Javier Benito from Batz S. Coop. 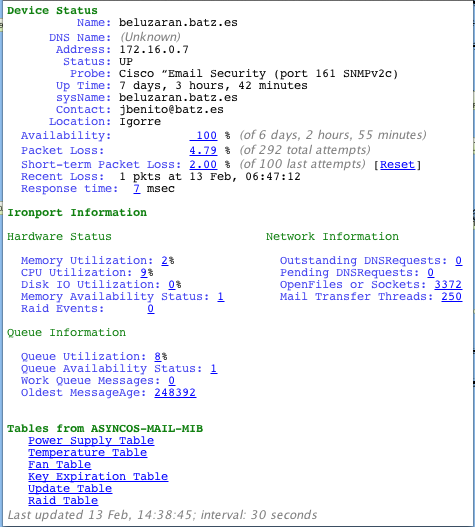 in Bizikaia, Igorre, Spain sends a probe that monitors Cisco IronPort email security appliances. 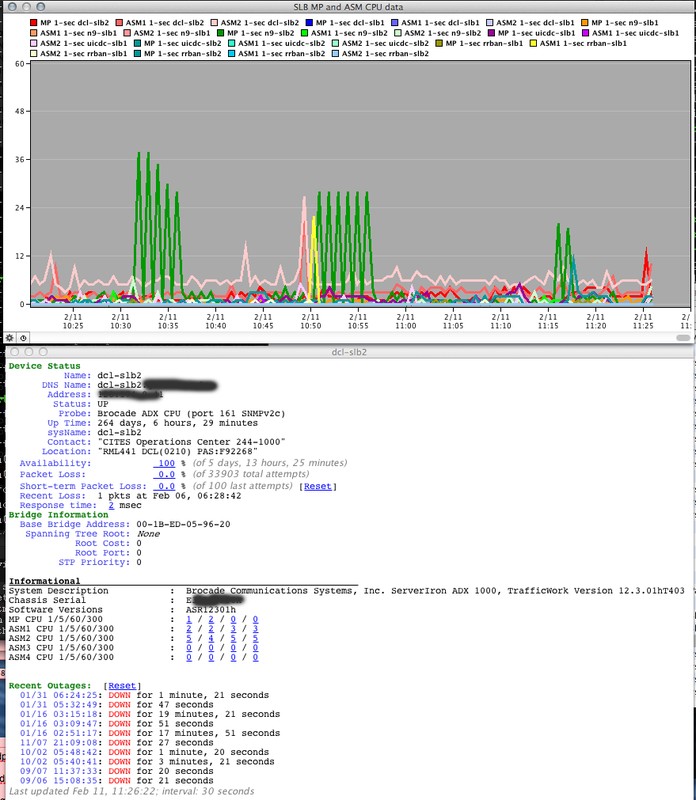 The probe monitors mails queue, CPU usage, Memory, Fan status, etc. James Pugh from eBay Enterprise submitted a probe that checks input and output rate on a specified interface and alerts on given rate of change thresholds over the time between polls. Additionally there are thresholds at which point alerts won't be generated because significantly small amounts of traffic can generate false positives. "We needed a way to be alerted to potential service impacting traffic spikes from either legitimate or malicious origin. Or conversely significant drops in traffic which may signal some other issue within the data center or applications." 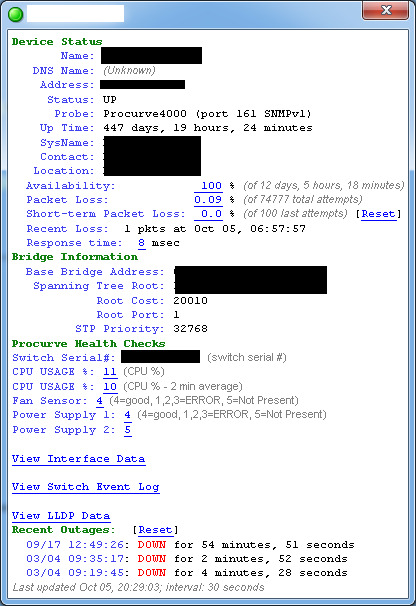 Espen Throndsen from MediaNetwerk in Oslo, Norway sends a probe that monitors hardware status on Cisco UCS C2xx equipment. Benjamin Hubert at Exane created this probe to monitor operating characteristics and system environment for the F5 BigIP. This probe monitors the BigIP LTM system, virtual servers connections. This is a comprehensive system state monitor probe for Infortrend EonStor. Benjamin Hubert at Exane created this probe to monitor device temperature and operating status for clocks, satellites, PTP and NTP modes. Monitors Promise E610F RAID device internal sensors: temperature, power supply, power supply fans, speed, blower speed, and cache battery status as well as some other basic drive information. 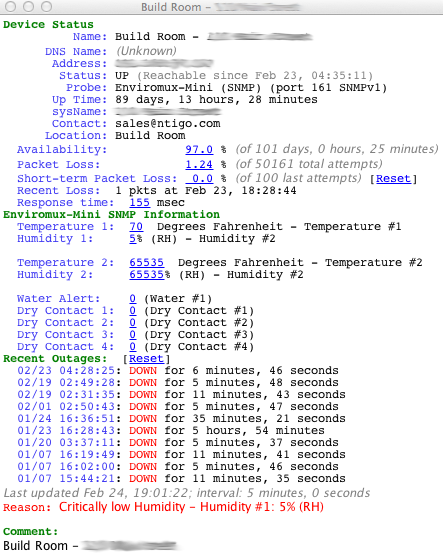 Monitors the CPU, temperature, optimization service status, and connection counts for Riverbed Steelhead appliances. This is a system and functional state probe for Riverbed/Steelhead Mobile Controller devices. Status information is queried from CPU and processes, SH Mobile activities (connected, healthy, degraded, critical and disabled), and licenses (total and in use). Monitor signal-to-noise for Comtrend DSL modem. Monitors the state of the input and output trays, toner/ink levels, and any alerts generated by the printer. Monitors the ink levels in an Epson 900N printer. May work for other network-attached inkjets with two cartridges. 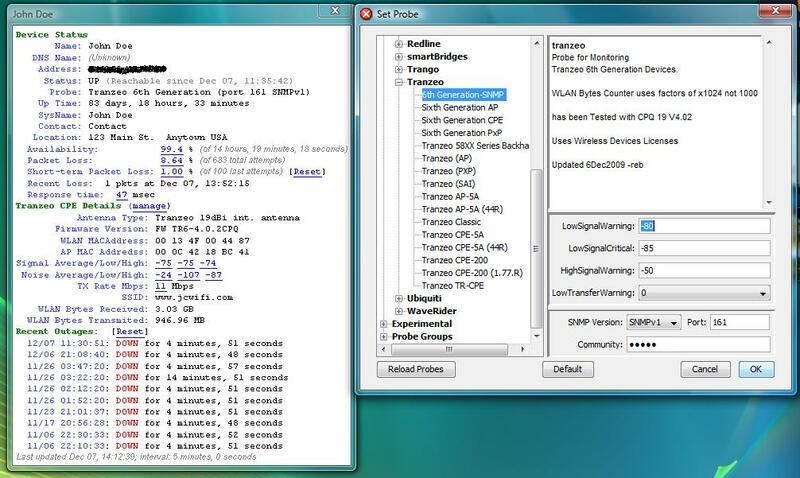 Monitors ink levels, media status, and some printer status on HP Designjet 1000, 2000, and 3000 series plotters using the SNMP to PML translator on the printer. Sasha Tchepourko at Griffith University created this probe to check for the number of AccessAccept, AccessReject, and DuplicateAccessRequest packets being processed by the RADIUS server. 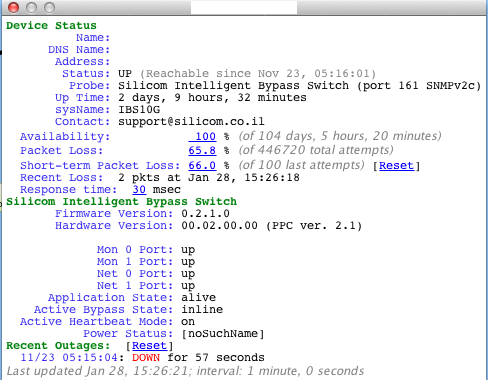 Check Heartbleed probe that checks an SSL server to see if it is vulnerable to the Heartbleed bug. Goes into Critical status if the device is vulnerable. 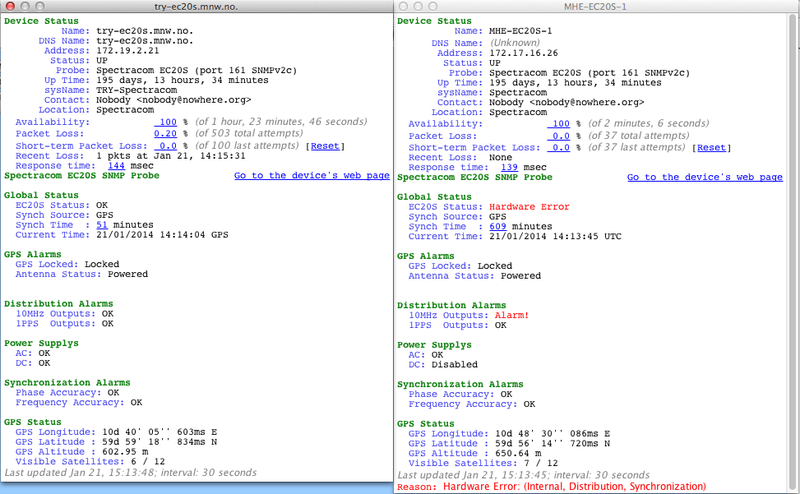 Checks TLS v1, v2, and v3, and SSL v3.0. The Check SSL Certificate probe for Intermapper will continually check a web server’s SSL certificate, and give you a warning when the expiration date is less than 30 days away, or go to critical when it’s less than 10 days away. The probe runs every six hours, so it won’t tax your server. 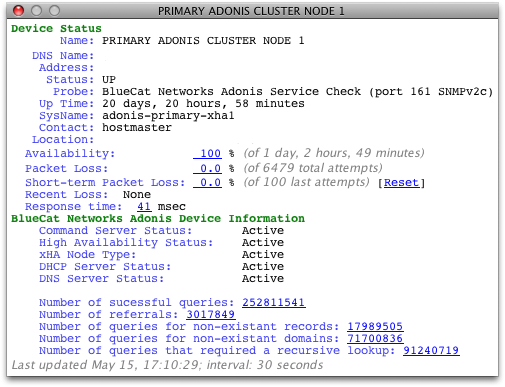 Monitors the current running status of the CommandServer, High Availability, DHCP, and DNS services, as well as polling for several DND server statistics. Monitors CPU Load for two CPUs, as well as Disk utilization, Allocation Failures and Memory Errors. Polls the overall System Status values for the Global System, Chassis, Power, Cooling, Voltage, Temperature and Storage subsystems. This probe works with any Dell server with OpenManage 4.0 and above installed. 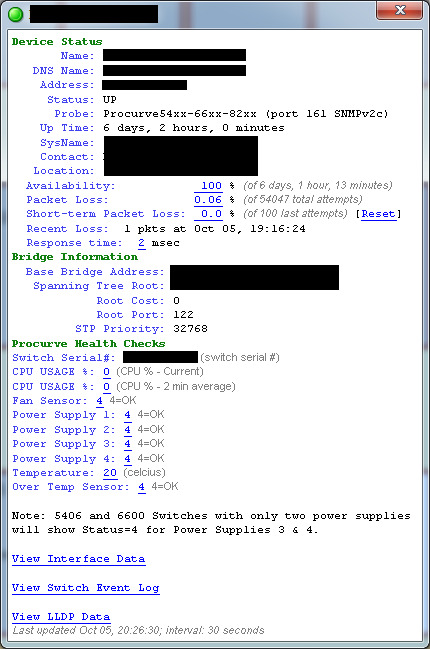 Monitors the hardware status for CPU, memory, power supplies, ILM log, fans, temperature and local storage. Changes in hardware status will trigger probe status changes and notifications. It also provides informative tables showing the file system, HP agent software, firmware revisions and what's in the PCI slots. 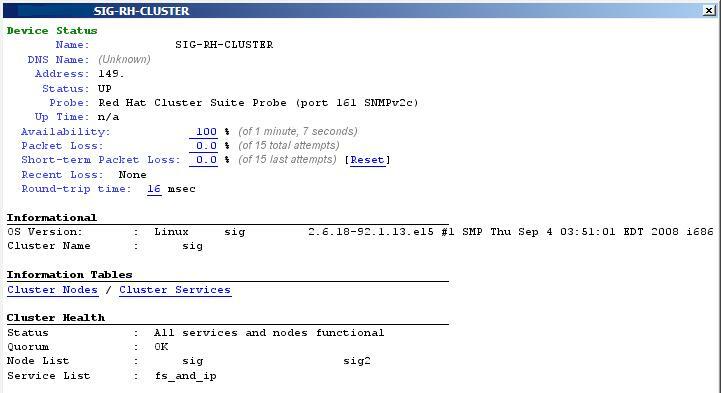 Displays the resource name and type of an IBM AIX HACMP high-availability cluster. Monitors the resource group for the number of resources and nodes. 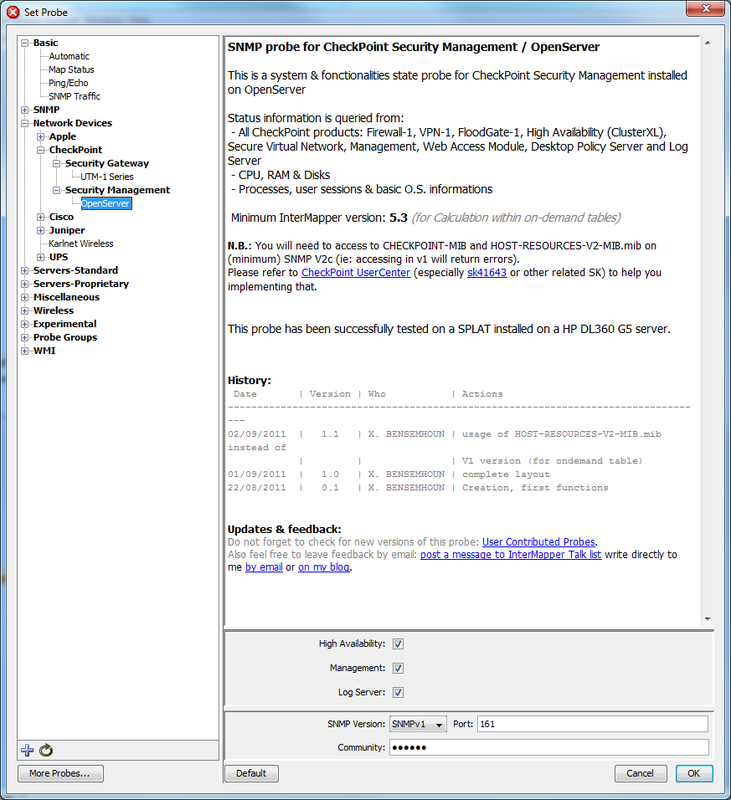 Monitors IBM hardware by querying the Bladecenter Management Module installed in Bladecenter. (Note: You must configure SNMP and network settings on the Bladecenter MM for your environment, and import the included mmblade.mib into Intermapper in order to use this probe. Monitors IBM hardware by querying the Remote Supervisor Adapter (RSA-II) card installed in the server. (Note: You must configure SNMP and network settings on the RSA for your environment, and import the included rtrsaag.mib file into Intermapper in order to use this probe. Tests a MeetingMaker server. It connects to the server and receives the list of calendars that are open. If the desired calendar isn't available, the device is marked as down. Monitors rates of routed and undeliverable messages (in messages per minute) on a Novell GroupWise server. 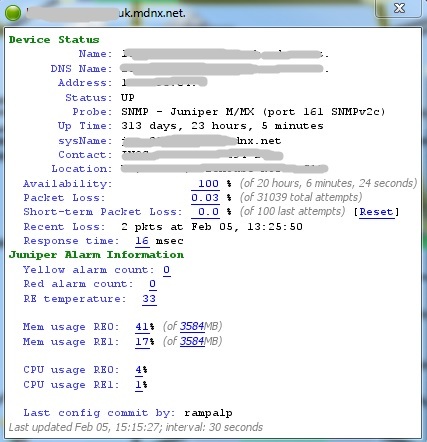 Monitors number of users connected, as well as messages and timeouts per minute, and client requests per second. Monitors free space on a specified Netware volume. Monitors the disk space (and overall server health) of a single disk (eg. 1000 series) Quantum SNAP Server. Monitors the disk space (and overall server health) of a dual disk (eg. 2000 series) Quantum SNAP Server configured to run as a single mirrored volume. 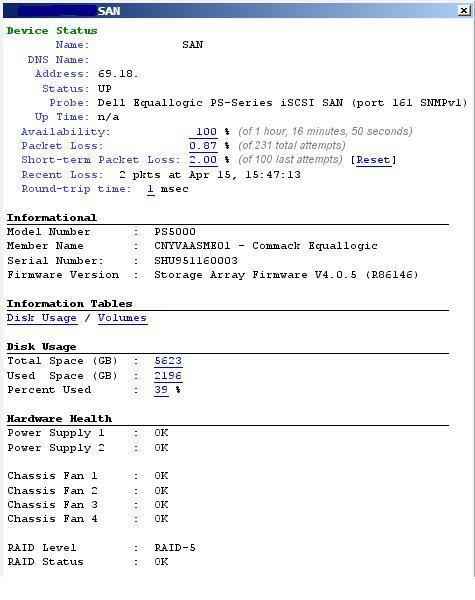 Provides Informational, Tables, Disk Usage, and Hardware Health information for Dell EqualLogic iSCSI SAN devices. Retrieves useful status variables about a NetApp 3050c filer. The probe assumes that the filer is clustered. 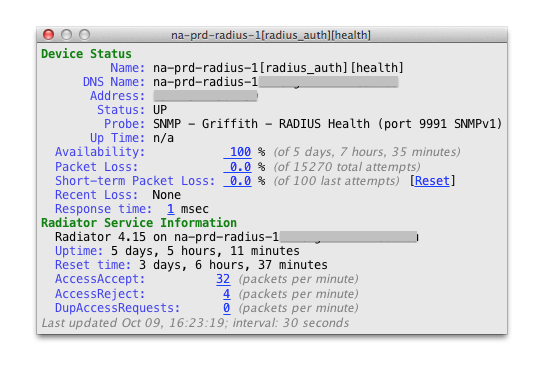 Gives a notification when traffic on a certain port/interface exceeds thresholds. Revised to give alarms if that interface goes down. Monitors traffic in packets per second, instead of bytes per second. This probe will provide a notification when traffic on a certain port/interface exceeds thresholds and give alarms when that interface goes down. Polls each interface of a 3Com 5500 switch, displays the current traffic in and out of each interface in kilobytes/second, and generates an alert if traffic on the monitored interface exceeds thresholds defined in the probe. This probe currently can only monitor one interface at a time. Polls each interface of an Astrocom device, displays the current traffic in and out of that interface in kilobytes/second, and generates an alert if traffic on the monitored interface exceeds thresholds defined in the probe. This probe currently can monitor up to three interfaces at a time. Debbie Fligor from the University of Illinois in Urbana IL sends a probe that monitors MP and LP CPU values for a Brocade ADX load balancer. She writes, "We needed to monitor (and graph) the CPU for the main processor, and especially the BPs which are the processors that do the L4-7 specialty stuff in the ADX to ensure that we had licensed enough BPs. 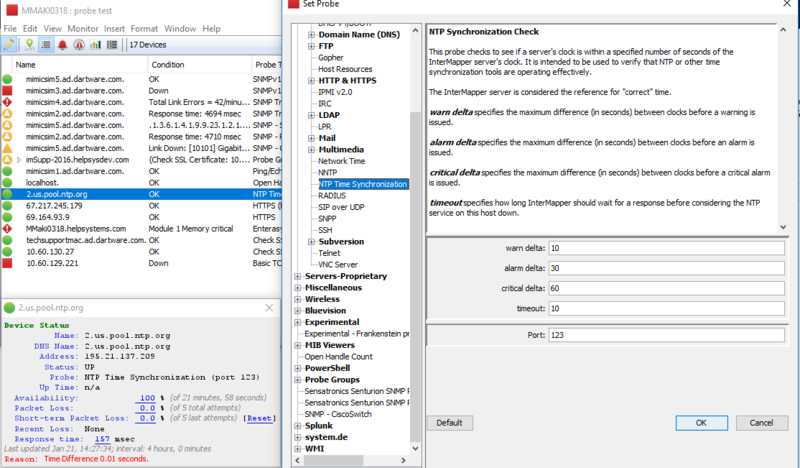 The solution was to make a probe that gathers those values via SNMP and display them in a useful format." These probes monitor the data returned by the CALIX-FAULT-MIB.my, CALIX-ONT-ETH-MIB.my, CALIX-ONT-MIB.my, CALIX-PRODUCT-MIB.my, CALIX-PROXY-AGENT-MIB.my, CALIX-SMI.my, CALIX-TC.my, and CALIX-TRAP-MIB.MY MIBs. To use them, first import all the MIB files (.my suffix) and then import the Probe files from the Probes folder. This is a system and functional state probe for Check Point Security Management installed on Smart-1. 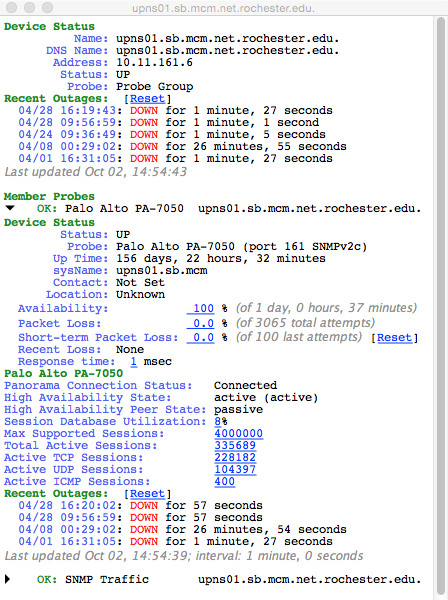 Wesley Austin from Oakland University in Rochester, MI sends a Cisco 3850 Stack probe. This probe was created to specifically monitor the 3850 Switches since no other probe is able to accurately monitor these devices with as much detail. It displays CPU utilization, free memory, and temperature, and has thresholds for the CPU utilization and temperature. 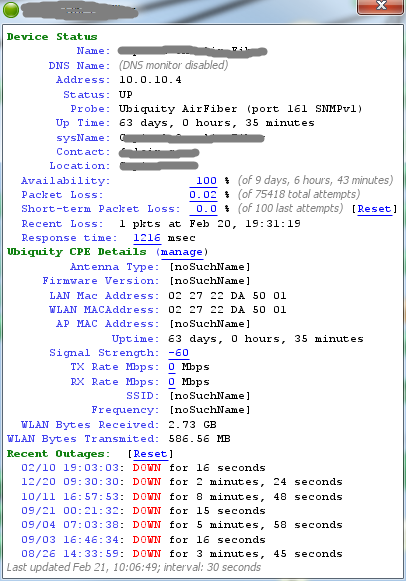 Artur Walczuk from Acxiom in Warszawa, Poland sends a probe that monitors a Cisco ACE Load Balancer. 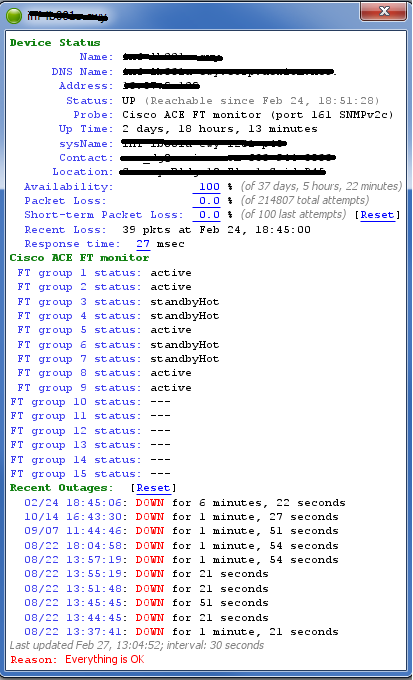 The probe checks the status of the Cisco ACE load balancers and also the status of their virtual contexts. Artur writes, "We have Cisco ACE load balancers which are running in active/standby pairs. When someone forgets to upload SSL cert on both units and save the config, the boxes are running out of sync. In this case, all new setups and modifications will not be populated to standby box. And in the case of failover, all recent changes are gone. "The probe checks the status of synchronization and shows which context on which box is active and which is standby. If boxes are synchronized, one should be active and send StandbyHot. If boxes are running out of sync then standby context is running into StandbyCold. "To prevent loss of config we need to monitor boxes and make sure nothing is in standbycold status. This probe marks the box in critical status if at least one of virtual contexts is not in active or standbyHot status." Provides Informational, Tables, Resource Usage, and Hardware Health information for Cisco Adaptive Security Appliance. 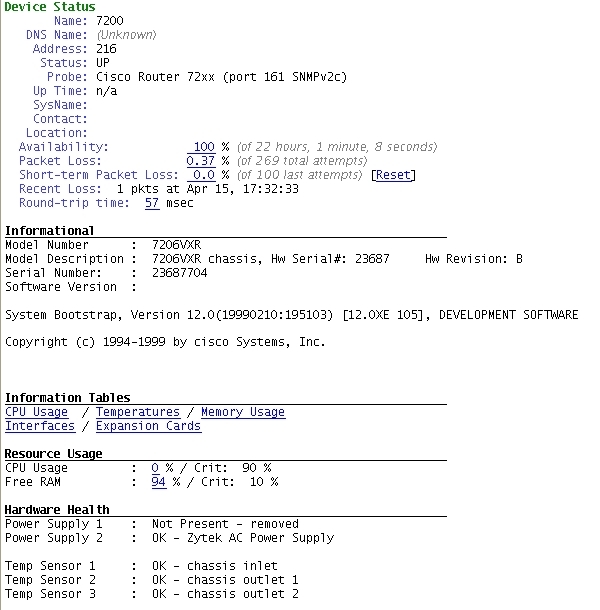 Monitors the CPU, memory and global connection parameters of a Cisco ACE module. 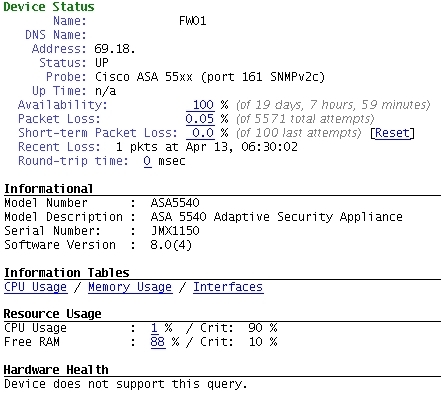 Monitors the CPU and Memory utilization and number of total, IPSec and IKE connections of a Cisco ASA 5500 Adaptive Security Appliance. 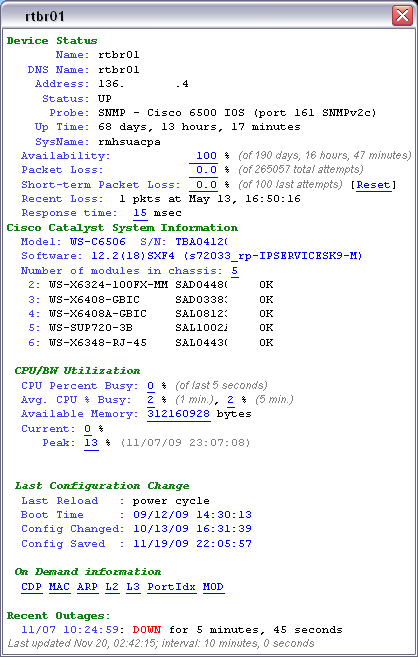 Monitors the CPU, Memory utilization, and number of connections of a Cisco Adaptive Security Appliance or PIX Firewall. 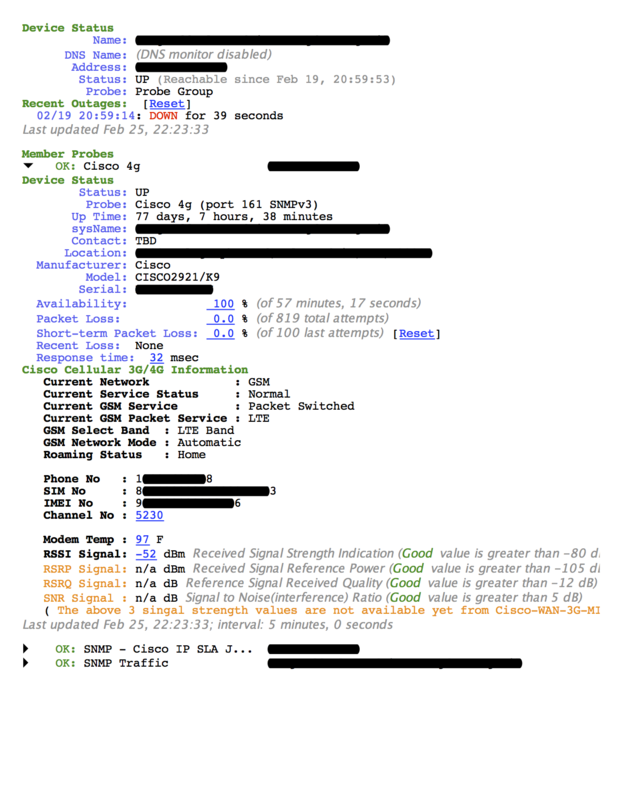 James Pugh from eBay Enterprise submitted a BGP Peer State probe that monitors the state of specified BGP peer and alerts if it becomes anything other than established. "We needed the ability to alert on the status of BGP peering that could cause business impact. The need arose because a BGP peer can go down even though a physical interface remains up." Monitors the status of a particular BGP peering session on a Juniper or Cisco router, and generates alarms when the BGP session goes down. Monitors the Utilization and power supply status of a Cisco 4000/4500/5000/5500/6000/6500 Catalyst switches (Hybrid CatOS/IOS). It displays type and status of modules present in slots 1 to 9. The probe provides On Demand tables. 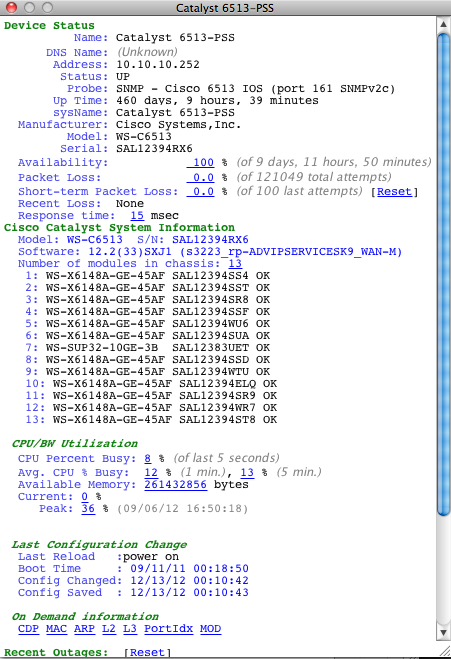 Monitors the CPU utilization and power supply status of Cisco 4000/4500/5000/5500/6000/6500 Catalyst switches. It displays type and status of modules present in slots 1 to 13. The probe provides On Demand tables. 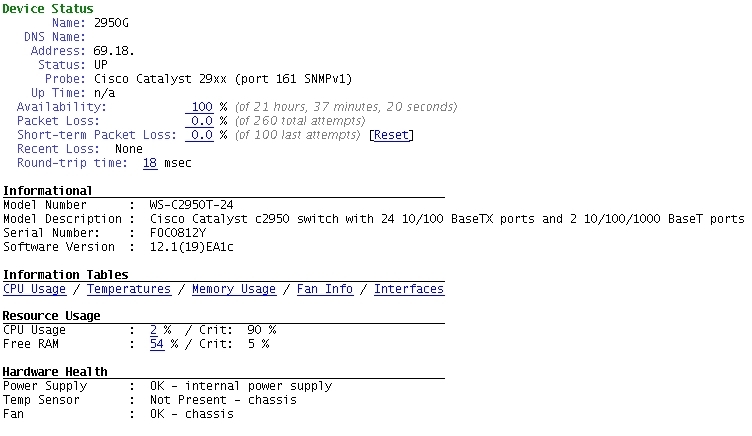 Monitors the CPU utilization and power supply status of Cisco 4000/4500/5000/5500/6000/6500 Catalyst switches. It displays type and status of modules present in slots 1 to 9. The probe provides On Demand tables. Provides Informational, Tables, Resource Usage, and Hardware Health information for Cisco Content Services Switches. 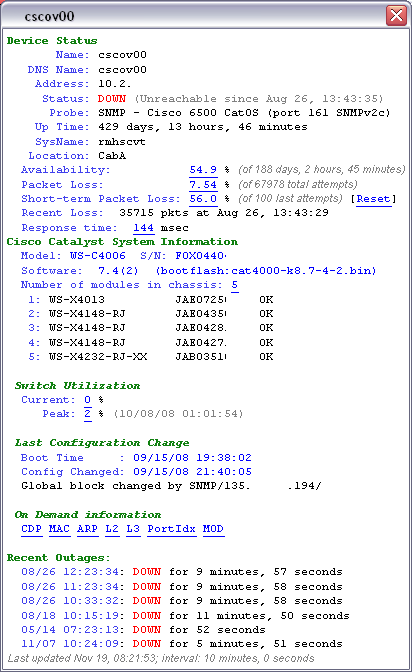 Monitors the connection parameters of a Cisco CSM. 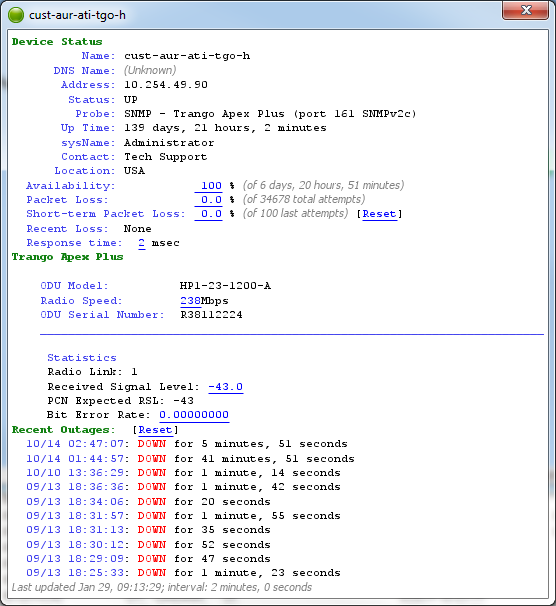 This enhancement to Intermapper's built-in SNMP-Cisco probe monitors the router's temperature, and allows you to set the device into alarm if the temperature exceeds your settings. 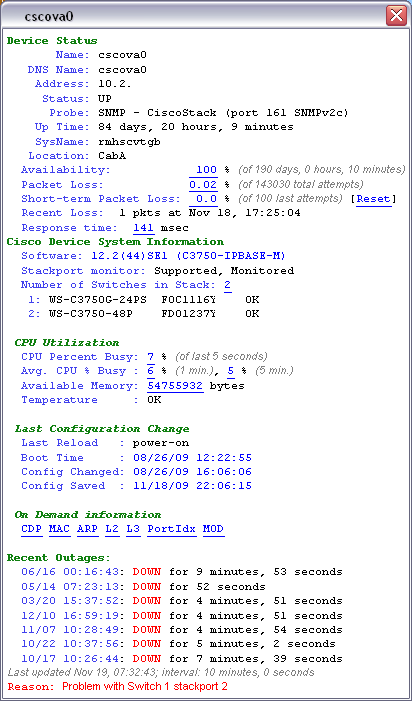 Monitors the CPU, memory utilization, and number of connections of a Cisco CSS server load balancer. 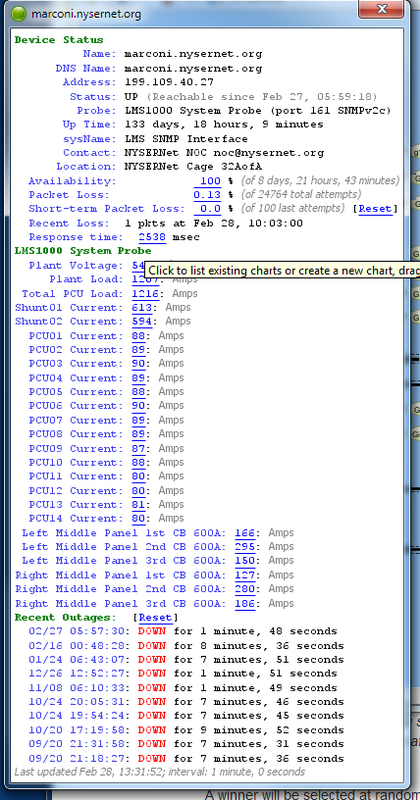 Monitors CPU and memory utilization, the number of connections, and performs interface polling. Use to monitor 4GB and higher interfaces. Also shows QOS drops. See description shown in the Set Probe dialog for further information. This probe monitors a physical interface that should be considered a CRITICAL link to a location or service. 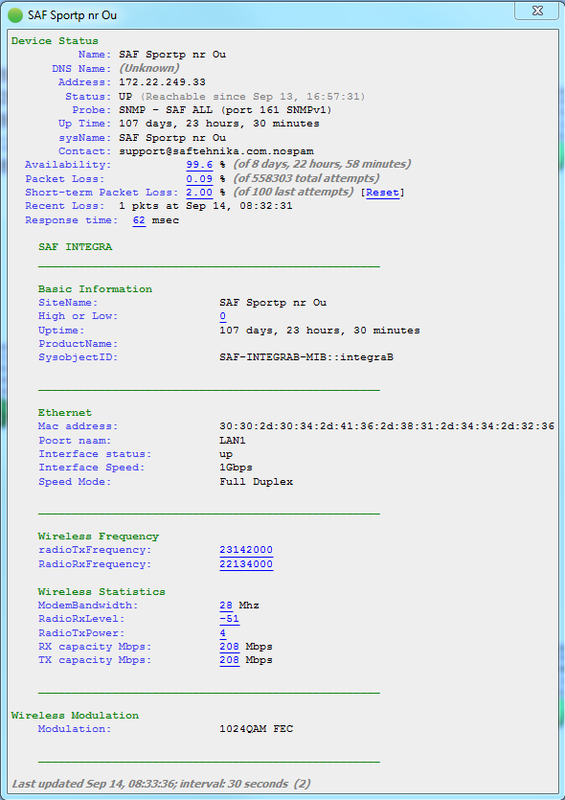 The ifTable with generic Ethernet details. The ifXTable that supports 64 bit 10G interface counters. Provide Informational, Tables, Resource Usage, and Hardware Health information for different series of Cisco Integrated Services Routers. 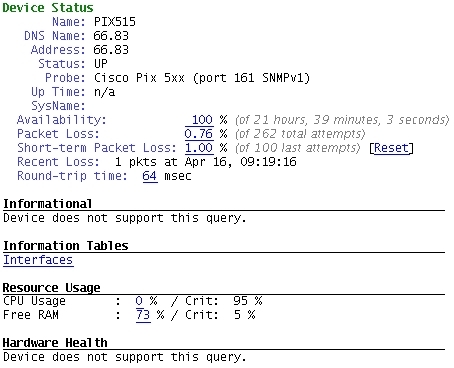 Extracts FTP test data from a Cisco IP SLA configuration that is running on a Cisco router or switch. 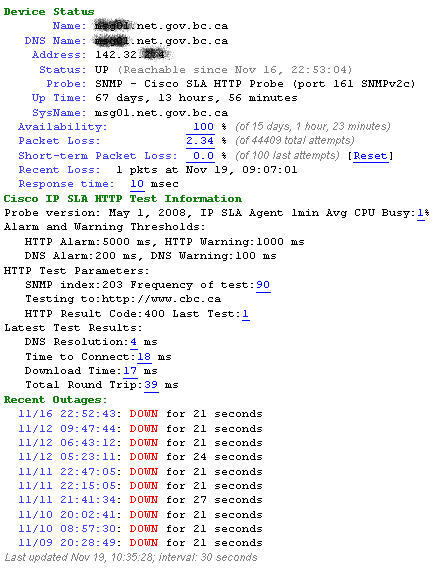 Extracts HTTP test data from a Cisco IP SLA configuration that is running on a Cisco router or switch. Benjamin Hubert at Exane created this probe to monitor the CPU and Memory utilization for a Cisco Nexus 3548P data center switch. Benjamin Hubert at Exane created this probe to monitor the CPU and Memory utilization for a Cisco Nexus 5672 L2/L3 10GB data center switch. Benjamin Hubert at Exane created this probe to monitor the CPU, Memory utilization, and current BGP peer connections. This probe monitors the particular OSPF neighbor state of an interface on a Cisco or Juniper router. 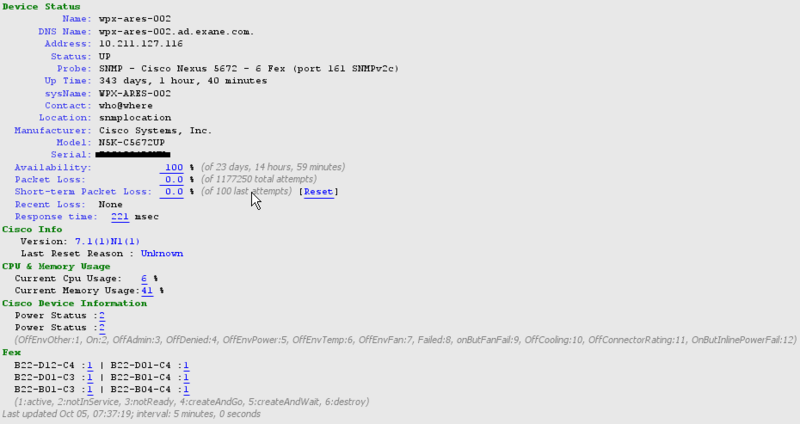 It generates alarms when the OSPF state is not full. Provides Informational, Tables, Resource Usage, and Hardware Health information for Cisco 5xx series PIX Firewall. Provide Informational, Tables, Resource Usage, and Hardware Health information for Cisco 72xx and 76xx series routers. 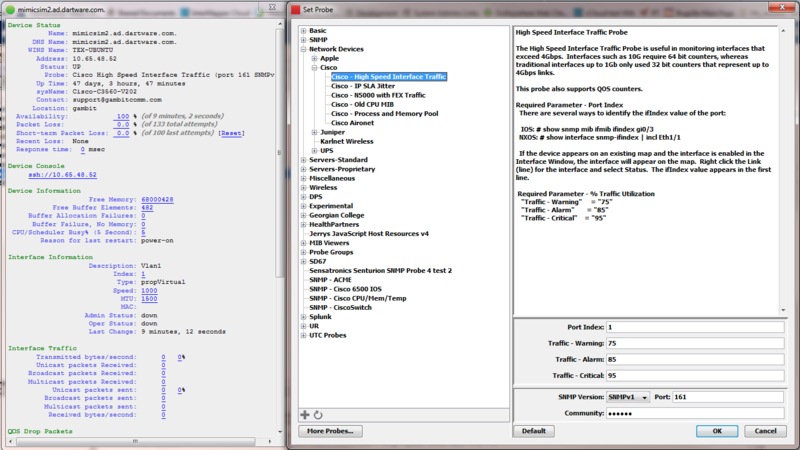 Monitors latency, jitter, or packet loss measured by a Cisco router with SAA installed, and produces alarms and warnings when they exceed user-specified thresholds. 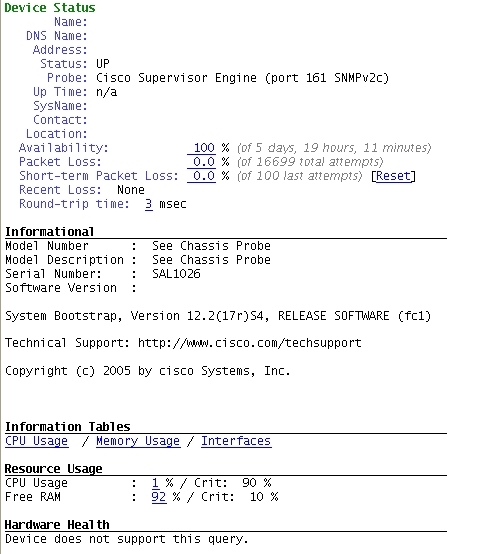 Monitors the performance of a Cisco SCE 2020 packet shaper. It can send alerts based on the number of active subscribers, the CPU utilization of any of the three Traffic Processors, and the Flows utilization of any of the three Traffic Processors. 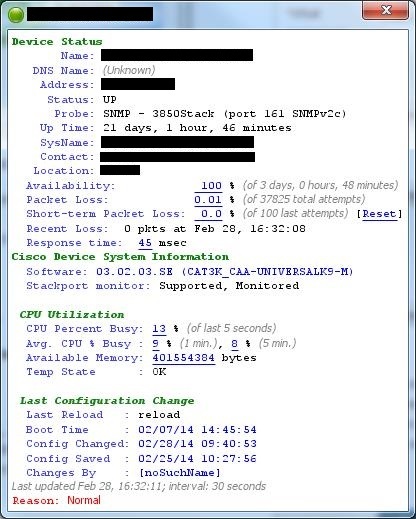 Kevin Cheng sends a probe that monitors the IP SLA characteristics for a Cisco router/switch. This probe can make an on-demand snmp query of the IP SLA Jitter test data and also collect the last 60 minutes of jitter data from a Cisco device.The probe will measure the RTT, latency and jitter between two routers for a particular interface/ifIndex. 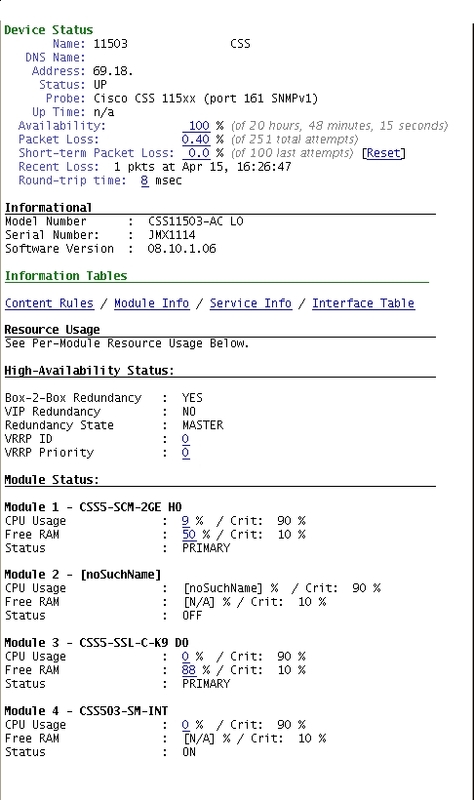 Provide Informational, Tables, Resource Usage, and Hardware Health information for Cisco Supervisor Engine. Benjamin Hubert at Exane created this probe to measure CPU, Memory, and health for stacked Cisco switches. 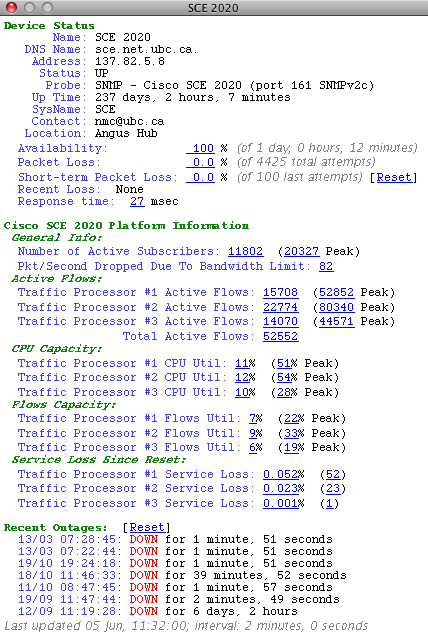 Monitors average CPU utilization and number of active sessions on Cisco VPN 3000 series concentrators. Provide Informational, Tables, Resource Usage, and Hardware Health information for different series of Cisco Catalyst switches. 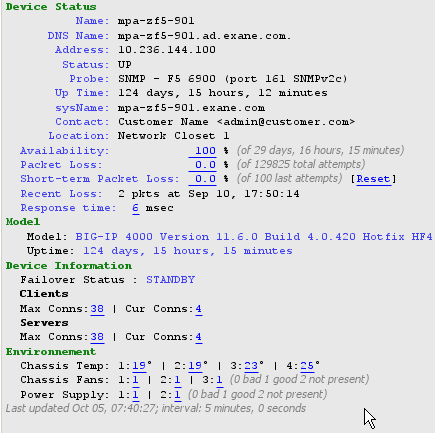 This is a system state SNMP probe for Fortigate firewalls. Status information is queried from CPU, RAM, Disks, AV & IPS version, Net traffic, Active sessions and HA. This probe monitors CPU, Power Supplies, Temperature, and Fan Sensor status. Matthew Wright of MDNX in Bracknell, Berkshire, UK sends a probe to monitor a Juniper ERX1440 series router for CPU/mem resource and the number of subscribers on the box. He writes, "We use Juniper ERX1440 devices on the network. We needed a way for Intermapper to alert on any problems and if there is a big drop in subscribers." 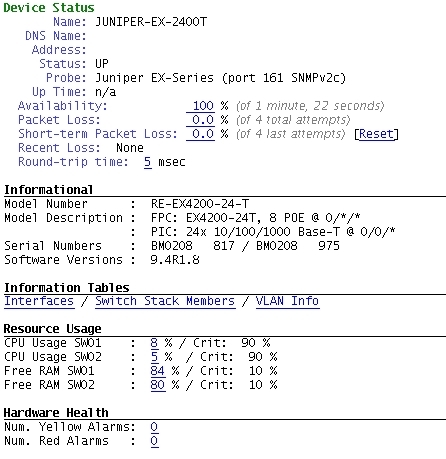 Provides Informational, Tables, Resource Usage and Hardware Health information for Juniper EX-Series switches. 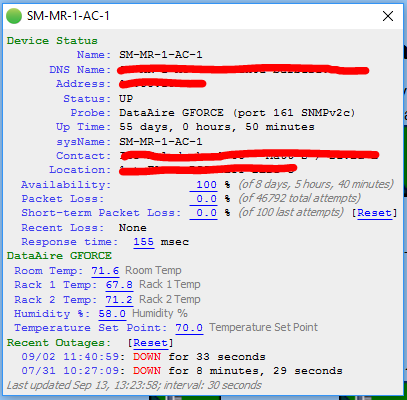 Matthew Wright of MDNX in Bracknell, Berkshire, UK sends a probe that monitors a Juniper M/MX series router for CPU/mem resource and also alarm conditions. 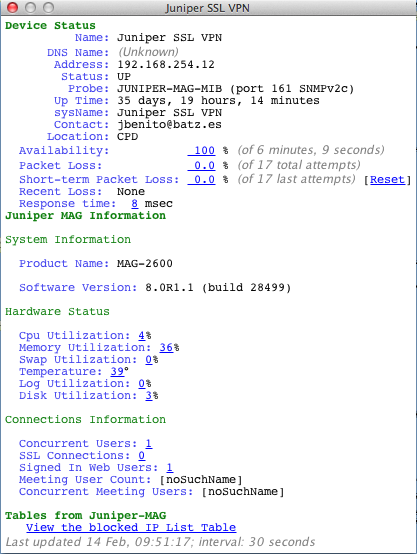 "Our core network uses Juniper routers and we needed a way for Intermapper to alert on any problems." Javier Benito from Batz S. Coop. in Bizikaia, Igorre, Spain sends a probe that monitors a Juniper MAG Series. 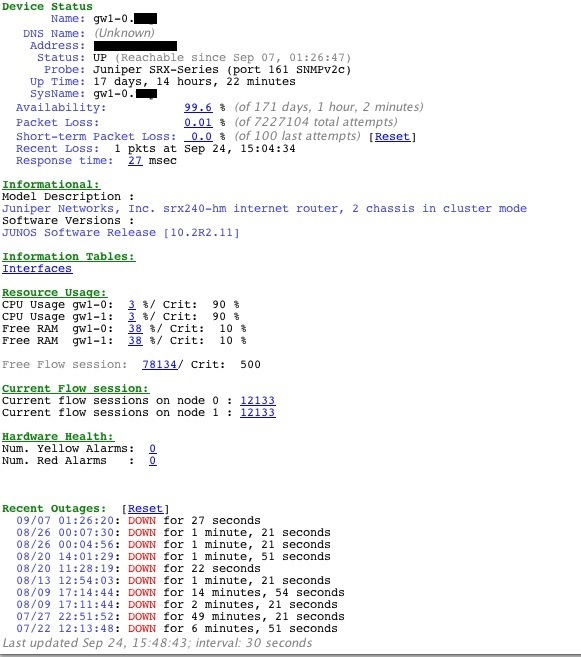 The probe monitors: Hardware Status, SSL connections, Meeting Users, and Login Atttempts. Matthew Wright from MDNX in Bracknell, Berkshire, UK submits a probe to monitor a Juniper MX80 series router for CPU/mem resource and also alarm conditions. "We have MX80 router in our core network. We needed a way for Intermapper to alert on any problems." 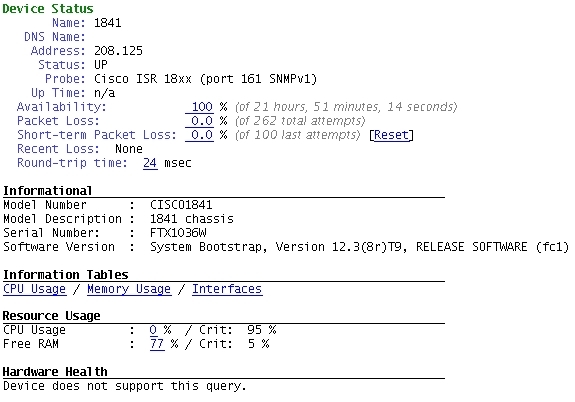 Monitors the CPU and Memory utilization of a Juniper Netscreen SSG security appliance using variables from NS-RES. This probe show CPU Usage%, Free RAM%, Logged In Users, Processes, Disk Usage, Power, Voltage, Cooling, Temperature, Disk Array. This probe shows CPU Usage%, Free RAM%, Logged In Users, Processes, Disk Usage, Power, Voltage, Cooling, Temperature, Disk Array. 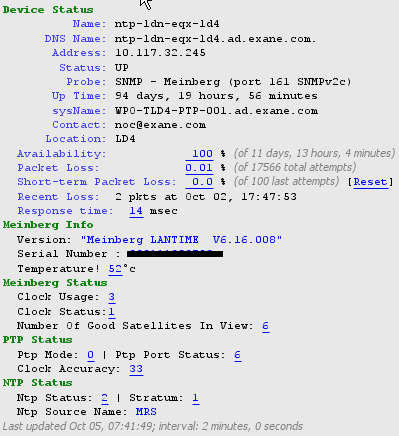 J Toth from NetEnterprise in Honolulu, Hawaii sends in a probe to monitor a Mailfoundry Email appliance. 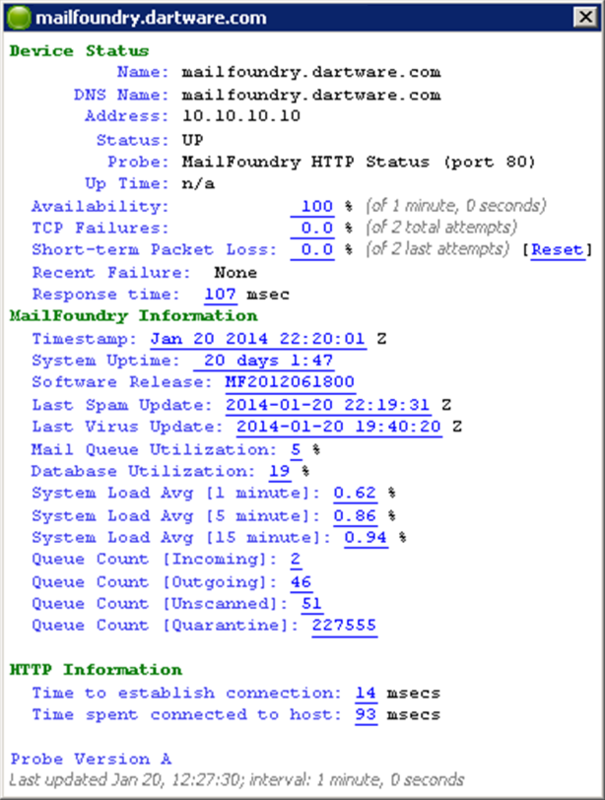 The Mailfoundry HTTP probe examines the HTTP status built into the Mailfoundry email security device and evaluates parameters including last antivirus and antispam definition update times and dates, database and mail queue utilization, system utilization and queue size based on user inputted thresholds. 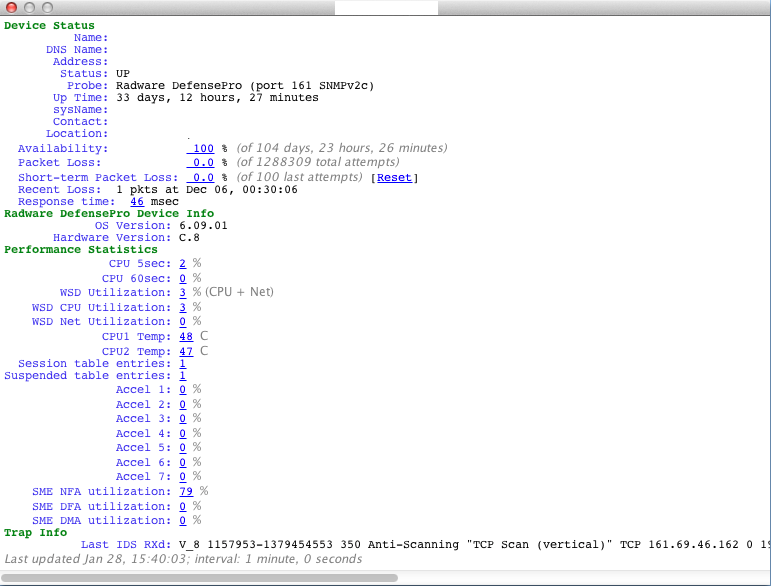 The probe was developed to monitor the system health and operation of the Mailfoundry appliance. Without the probe, the only way to determine if definitions were being updated and emails processed on a timely basis was to login to the system and manually check. The probe enables unattended real time monitoring of critical system parameters. Monitors the CPU, Switch Fabric, and Buffer utilization of a Passport 8600 router. 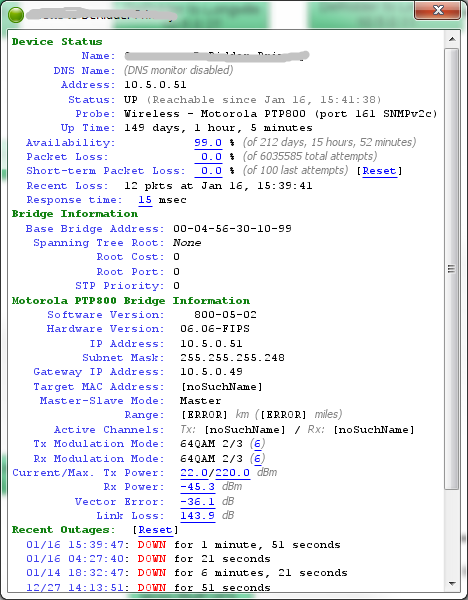 Tells a Nortel device to ping the specified address, and returns whether the ping succeeded. David Stempien at the University of Rochester created this probe to monitor a PaloAlto PA-7050 Enterprise Security appliance. Operating state is monitored and checked for alarm state. Utilization information is provided for active sessions. This is a system state SMNP probe for Panorama Management console. Status information is queried from CPU, RAM, Disks and Net traffic. 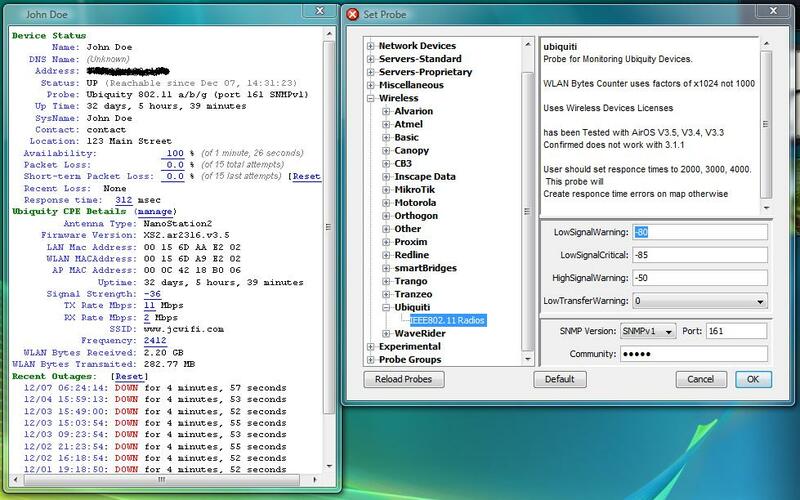 This probe monitors the performance of a Procera PacketLogic packet shaper. Connections Alarm Threshold is the ALARM threshold for Number of Connections. If the Number of Connections value exceeds this threshold the device will enter the Alarm state. Connections Warning Threshold is the WARNING threshold for Number of Connections. If the Number of Connections value exceeds this threshold the device will enter the Warning state. James Pugh from eBay Enterprise also submitted a probe for the Radware DefensePro Intrusion Detection System (IDS) that monitors interface statistics, CPU and accelerator utilization, as well as cpu temp and fan and power supply status among other variables. It will also alert on received trap variables indicating high threat IDS events. "We needed a way to monitor critical statistics of the Radware DefensePro as well as alert on certain IDS events. The probe provides the ability to alert on events that occur in real time as well as the typical statistics that one wants to know about a piece of hardware." Stephen McDonald from Xerox sends a probe that monitors a Riverbed Steelhead WAN optimizer appliance. The probe displays Riverbed specific metrics including reduction % in/out, peered devices, processes, and reduction per port. Stephen writes, "The built-in reporting interface for Riverbed is nice, but it's a pain to have to log into each one individually to get per device status. Riverbed CMC product can do this - but at extra cost of course." James Pugh from eBay Enterprise sends a probe that monitors the port and bypass status of a Silicom Intelligent Bypass switch. "These bypass switches don't use any standard MIBs. We needed a way to monitor the status of the interfaces, whether up or down, as well as the status of the bypass mode should it be triggered to take the monitoring equipment that is otherwise inline out of the link." Peter Wahlberg from Media Netwerk AS in Oslo, Norway sends a probe for monitoring a number of parameters for a GPS synchronization unit. It checks that the unit has Signal Lock, enough visible satellites, hardware status (H/W modules, Power Supplies, etc.) and provides necessary information (GPS Longitude, Latitude, Altitude, Current time). "We're operating an DVB-T SFN network and using these devices for syncing our devices. If the sync disappears for a short time, our devices will mute their output and all customers in that region will lose their tv channels. This probe gives us a 'heads up' when this happens and gives us time to re-establish proper synchronization. It also shows why the sync was lost." 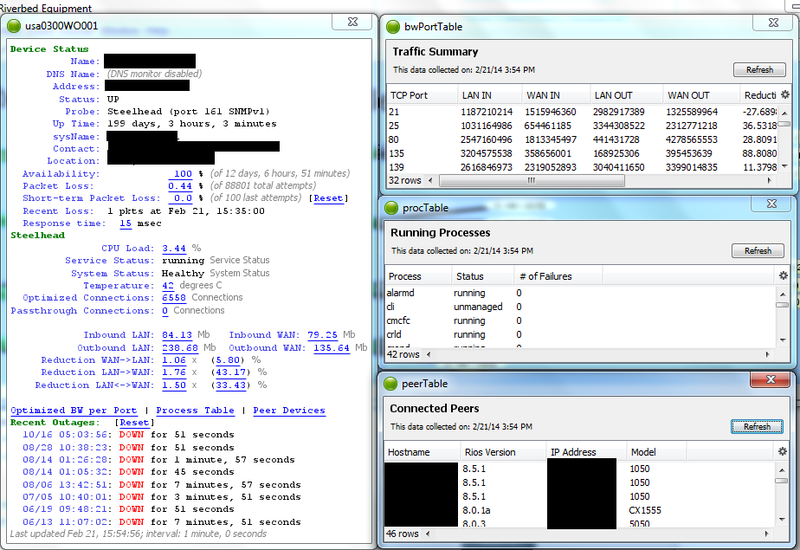 Monitors CPU, memory, critical log messages, and the number of passed/blocked packets for a TippingPoint IPS. Scans the Adtran 1248 DSLAM to see if any of the sub-tended clients in the stack are communicating or not. Shows errors on an Ascend CSU. 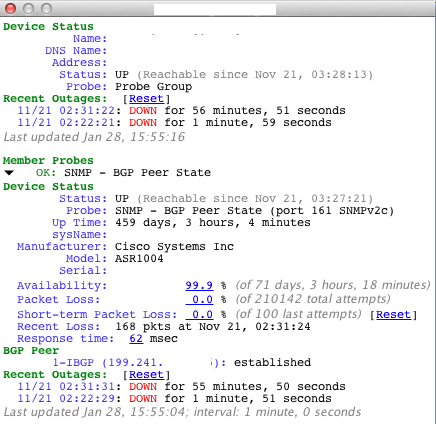 Monitors Cisco CallManager registered and unregistered phones. 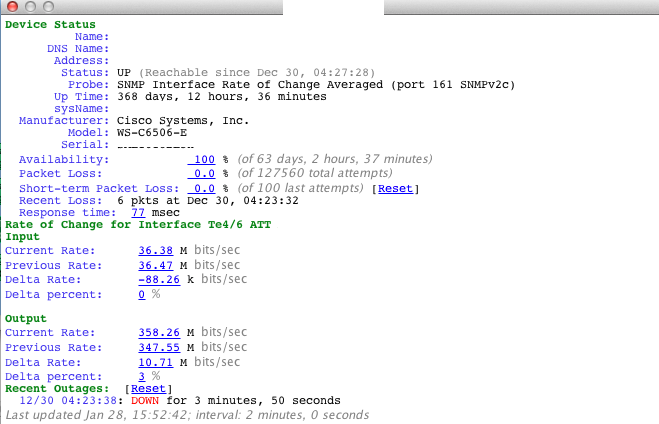 Displays Errored Seconds, Severely Errored Seconds and Unavailable Seconds from the Transmission MIB of a Cisco CSU. 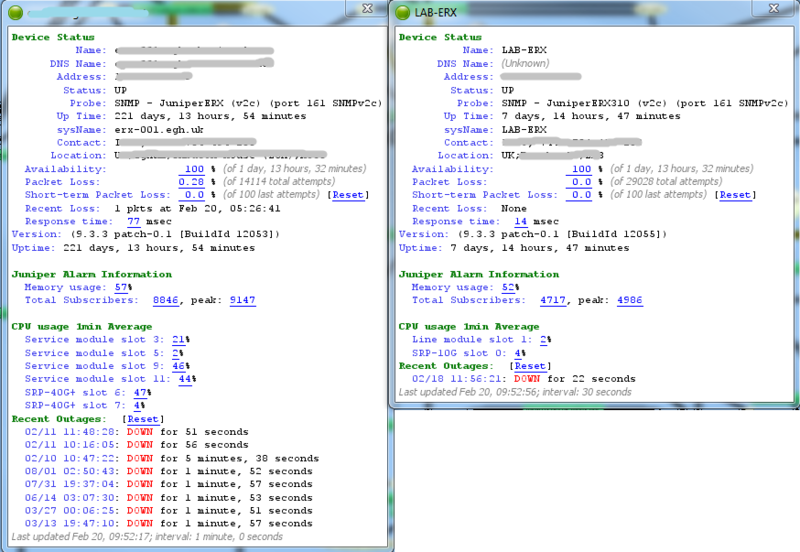 The probe shows stats for both the current 15 minute interval and the last 24 hours on the first T1 CSU. Alarm thresholds can be set for current interval Errored Seconds and Severely Errored Seconds. Queries for current program number, safe signal state, bit error ratio, signal to noise ratio, signal level, AFC level, and video bitrate. The device will alarm on safe signal state, safe signal ratio and safe signal level. Monitors signal status, LED status, and device alarm state. The probe will alarm on device alarm state, triggered alarms and alarm bypass mode. 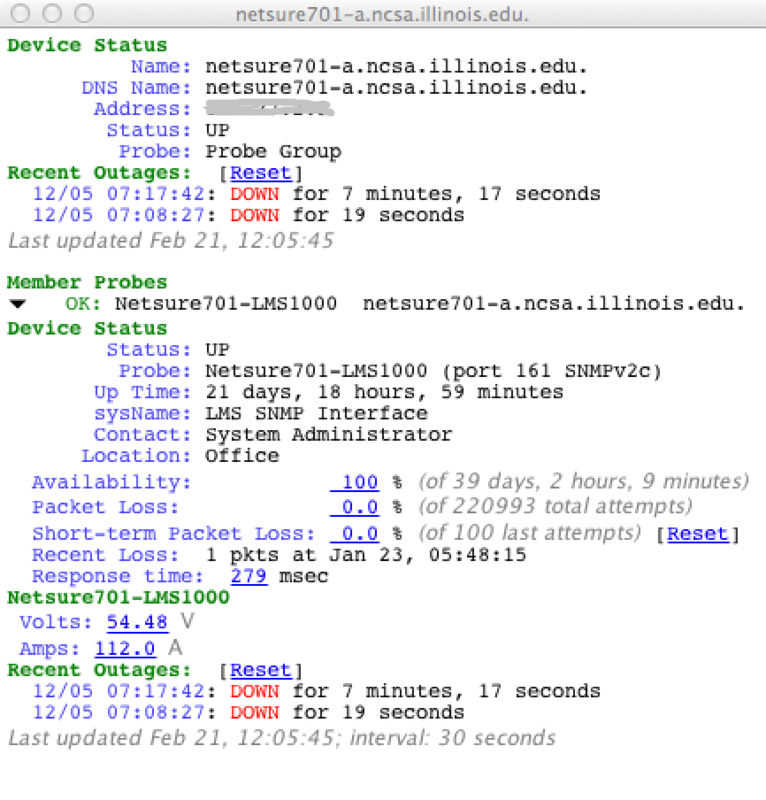 Monitors the status of a Tut Systems campus modem. SAF Tehnika Monitoring probe, submitted by Dimitri Verhoeven of Exclusive Networks as part of the 2017 probes contest. Monitors 3-phase APC rack-mount PDUs. The probe checks all three phases for load plus current for each of the individual phases. Warning, alarm and critical thresholds can be set for current. Reports status conditions for APC Silcon UPS. It's geared for a three-module N+1 setup on 208v power, and warns about load when you are in danger of going out of redundancy (as opposed to reaching the one-module tolerances), but the thresholds are fully adjustable. Monitors a BestPower Uninterruptible Power Supply (UPS). Monitors battery status for Eaton 5P-550. Timothy Loput of the Beaverton School District submitted this probe as part of the 2017 Intermapper probes contest. Paul Wefel from NCSA at UIUC sends a probe that monitors an Emerson -48v DC system current and voltage Uninterruptible Power Supply (UPS). If the Emerson is running on battery, we need to know when the system voltage is about to fall below the system cutoff value. The probe also allows us to baseline current consumption and alert if there is a change indicating a possible failure in the active redundant unit. Monitors the SCC and static switch of the Liebert 600 UPS. Polls an AirCon for its alarm settings and current readings, and allows user-specified pre-alarm (warning) and critical values. Steven Matkoski from NYSERNet, Inc. in Syracuse, NY sends a probe for the Emerson/Marconi LMS1000 Uninterruptible Power Supply (UPS). It reads the voltage and amperage of the device, and alerts at certain thresholds. Steven writes, "We had absolutely no ability to monitor these devices. With this probe, the UPS fits nicely into our remote-site management." Monitors an MGE EPC 6000 UPS with a UM-Link Ethernet interface, including phases B and C.
Josh Marsh from Gresham-Barlow School District in Gresham OR, sends a probe to provide basic monitoring for the Minuteman UPS SNMP-Net interface card. It shows basic info, load, temperature, and time remaining. The probe also supports much larger UPSes, so designing the output to only show the valid info was interesting. There was also some work that needed to be done on formatting, due to output inconsistancies. 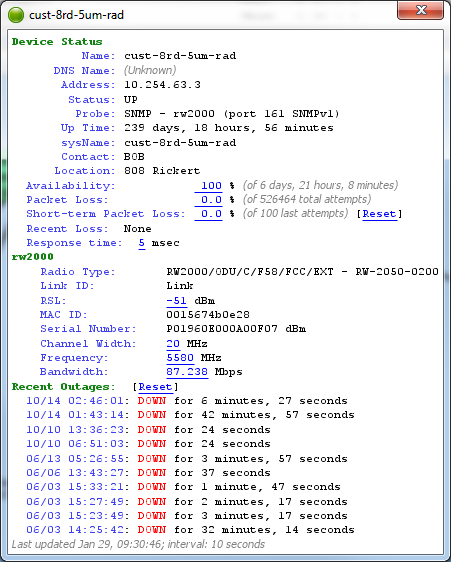 Tests the MinuteMan SNMP-NET card, and is compatible with SNMP-NV6. Monitors Sentry 3 CDU. This probe is based on two infeeds, each with two branches (AA, AB, BA, BB) and does give false alarms for CDUs with one infeed (AA, AB) since it can't communicate with the B tower. Displays CPU utilization, total RAM, free RAM, the first three WLANs, and tables for Connected APs and Rougue APs. Monitors Breezecom line of equipment from Alvarion. Monitors several variables of a Bridgewave AR80 radio: serial number, model number, received signal level (in dBm). Augmented to include data for: Input Voltage, Unit Temp, Transmitter Temp, Calibration Voltage, Copper Link Utilization, Fibre Link Utilization, Radio Link Utilization, Radio Link Rate, Data Errors, Pre/Post FEC Errors. Monitors several variables of a Bridgewave AR80 radio: serial number, model number, received signal level (in dBm). Brian Fults of Louisiana Radio Communications, Inc. sends a probe to monitor a Motorola Cambium PTP800 licensed spectrum backhaul radio. It monitors and displays a variety of information, including mode and association, range, active channels, transmit and receive modulation mode, current and maximum transmit power, receive power, vector error, link loss, and signal-to-noise ratio. It will go into alarm and warning states based on user-specified levels for the modulation/speed mode, received power, vector error, link loss, and signal-to-noise ratio. Scott Piehn from Computer Dynamics in Freeport, IL sends a probe that monitors a Canopy CMM Micro. The probe displays Firmware version, Location, GPS Station, and Each Port Status. It also issues alerts on low Satalite, and allows port identification without going into device. Mucio Lugo at Vista Broadband created this probe to monitor Power level, Frequency, and more. Luis Ortiz at SkyData created this probe to monitor the Ceragon IP-10 Wireless Backhaul. Various operating and environmental information is displayed, with alerts for temperature, receive power, and input voltage. 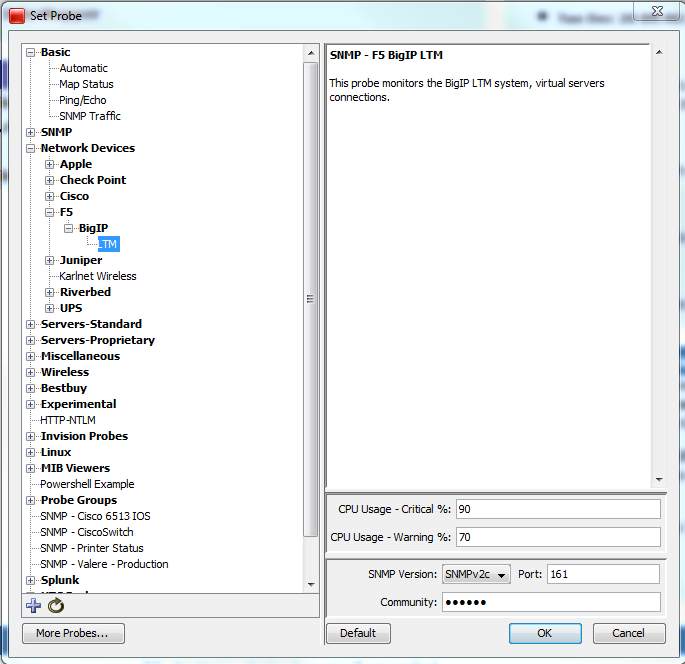 Kevin Cheng sends a probe that monitors a Cisco 3G/4G WAN interface. The probe provides information about the cellular radio, including: Cellular card temp, whether it's using GSM or LTE, and these statistics for the radio: RSSI, RSSP, RSRQ, SNR. Monitors Serial Number, AP Type, Modem Sync LED, Rx Cable Loss, Tx Cable Loss, RSL, and BER. Tim also provides the MIB for the radio along with the probe. Monitors a DragonWave Horizon Duo radio to report on: serial number, type and speed of DragonWave link, received signal level (in dBm) for both channels, signal to noise ratio (in dBm), up/down status of link on both channels. Monitors a DragonWave Horizon radio to report on: serial number, type and speed of DragonWave link, received signal level (in dBm), signal to noise ratio (in dBm), up/down status of link. Monitors a Ligowave radio to report: current Tx frequency, signal level (in dB), link quality, configured speed (in kbps), transmit power (in db), channel bandwidth (in MHz), noise level (in dBm), MAC address of the unit. 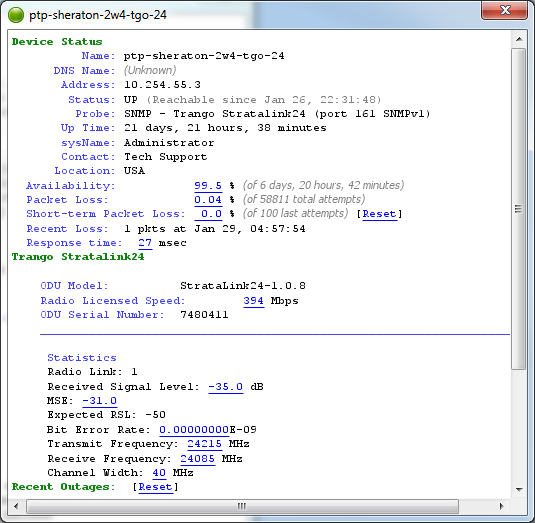 Scott Piehn from Computer Dynamics in Freeport, IL sends a probe that monitors a Mikrotik PTP Wireless Link. The probe reports: Board Type, ROS version, Board Firmware, Frequency, TX/RX Signal, Link Uptime, SNR, CCQ, TX Rate, SSID, CPU Load. It issues alerts: Low Signal, High Signal, Low Transfer. Scott Piehn from Computer Dynamics in Freeport, IL sends a probe that monitors a PacketFlux 12v Battery Base Unit. The probe reports Firmware version, temperature, 12v Battery Level, Battery Charge Left, AC Voltage Presence, Watchdog IP. It issues Warnings for Temperature, Battery Voltage Level, and No AC Voltage. Scott Piehn from Computer Dynamics in Freeport, IL sends a probe that monitors a PacketFlux 24v Battery unit. The probe reports Firmware version, temperature, 24v Battery Level, Battery Charge Left, AC Voltage Presence, Watchdog IP. The probe issues Warning for Temperature, Battery Voltage Level, and No AC Voltage. Scott Piehn from Computer Dynamics in Freeport, IL sends a probe that monitors a PacketFlux Temperature Module. The probe displays Firmware version and Temperature for two external probes, and alerts on high and low temperature for each probe. Tim Huffman of Business Only Broadband in Lombard, IL, sends a probe that monitors the Radwin 2000 radio. It gives transmit frequency, channel width, current bandwidth, and signal level. Paul Desmet at Techaccess created this probe for all Radwin transmitters. 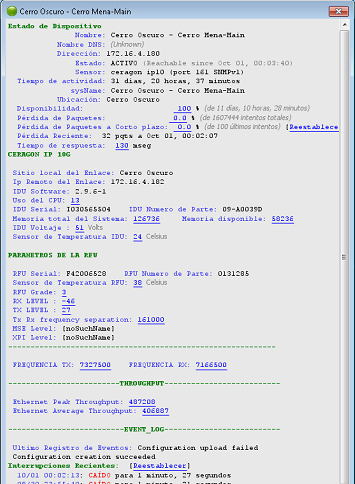 It lists all important values needed for support purposes on Radwin 2000 and 5000 equipment including frequencies permitted and forbidden, interfaces, and throughput. Probes a Redline AN-80 point-to-point radio, acting as either a master or slave, to retrieve and display a number of critical statistics for the radio, and give alarms based on user-specified thresholds. Tim Huffman from Business Only Broadband in Lombard, IL sends a probe that monitors the Trango Apex Plus Radio, and alarms if the link is down or the link is taking errors. Tim Huffman from Business Only Broadband in Lombard IL sends a probe that monitors a Trango StrataLink 24GHz Radio. It alarms if the link is down or the link is taking errors. Reports Antenna Type, Firmware, Connected AP MAC Address, Signal Strength, Noise, Connected SSID, and Total Bytes In/Out. It issues all warnings from the SNMP Traffic probe and alerts on Low Signal, High Signal, and Low Transfer rate. Brian Fults from Louisiana Radio Communications, Inc. sends a probe to monitor a Ubiquiti Air Fiber point-to-point backhaul radio. It displays the following information: Antenna Type, Firmware Version, Uptime, Signal Strength, Tx & Rx Rate, SSID, Frequency, and WLAN traffic. It has been Tested with AirOS V3.5, V3.4, V3.3, and confirmed not to work with 3.1.1. Set response times to 2000, 3000, 4000 otherwise this probe will create response time errors on map. 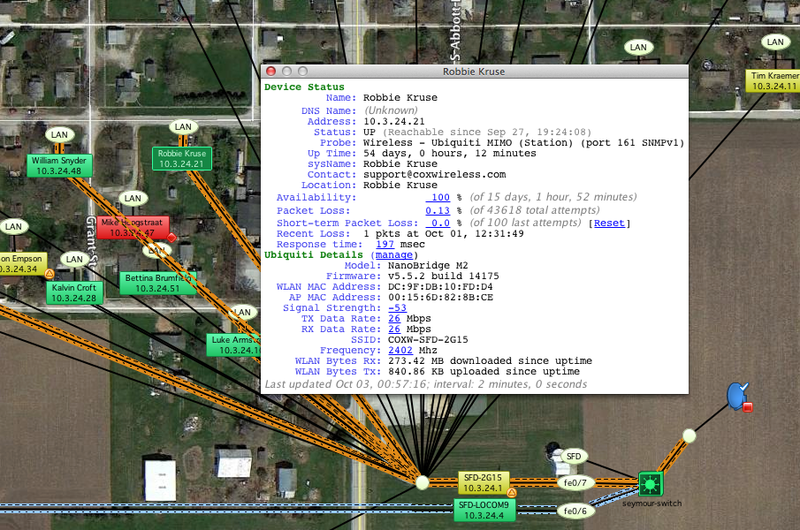 Scott Piehn from Computer Dynamics in Freeport, IL sends a probe that monitors a Ubiquiti AirFiber 24 V1.5 backhaul radio. The probe reports: SSID, Mode, Firmware, Signal, Frequency, Capacity, Satellites, Duplex Mode, and alerts on low Satellite, Low Signal. Duane Cox at Cox Wireless created this probe to monitor RSSI and RF TX/RX data rates for Ubiquiti AirMax hardware with 5.x firmware. It also displays SSID and firmware version. Reports Antenna Type, Firmware, Device MAC Addresses, Connected AP MAC Address, Signal Strength, TX/RX Rate, Connected SSID, Total Bytes In/Out. It issues warnings for Low Signal, High Signal, and Low Transfer rate. Scott Piehn from Computer Dynamics in Freepot, IL sends a probe that monitors the Ubuquiti M-line Access Point (AP). The probe reports Radio Type, Firmware Version, MAC Address, SSID, and Bytes rx/tx, and allows identification of key radio settings without getting into the radio. 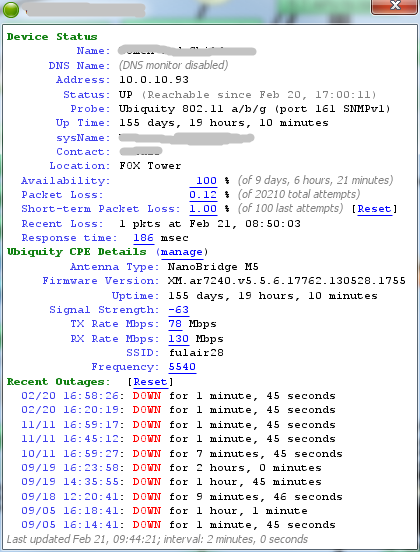 Brian Fults from Louisiana Radio sends a probe to monitor the Ubiquiti Nano Bridge Customer Premise Equipment (CPE). It displays the following information: Antenna Type, Firmware Version, Uptime, Signal Strength, Tx & Rx Rate, SSID, and Frequency. It has been Tested with AirOS V3.5, V3.4, V3.3, and confirmed not to work with 3.1.1. Set response times to 2000, 3000, 4000. Otherwise this probe will create response time errors on map. Duane Cox at Cox Wireless created this probe to monitor RSSI and RF TX/RX data rates for the Ubiquiti NanoStation M2. It also displays SSID and firmware version. Scott Piehn from Computer Dynamics of Freeport, IL, sends a probe that monitors a Ubiquiti Wi-Fi Access Point (AP). It reports Antenna type, Firmware version, MAX Address, SSID, Frequency. This allows identification of key settings without going into device. Monitors a Valere Rectifier to report: software version, overall module status, output voltage from slot 1 (divide number to get volts), output of rectifier in slot 1, internal temperature, AC failure, battery discharge. 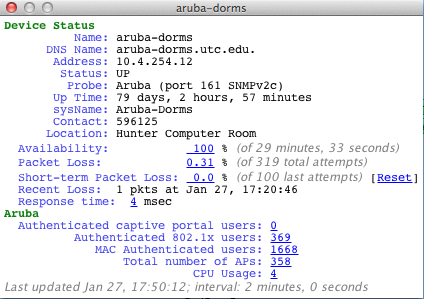 Christopher Howard from the University of Tennesee at Chattanooga sends a probe that monitors Aruba Wireless controllers by pulling information associated with client counts and hardware statistics. It has been tested with Sup1, Sup2, 3600 series, and M3 series controllers. It currently grabs user counts including MAC authenticated users, 802.1X authenticated users, and captive portal authenticated users. It also grabs the total AP count and CPU usage. Aruba Wireless controller, submitted by Manickaraja Arumugam of Aricent in the 2017 probes contest.